This 16-lesson, sixth edition, comprehensive manual for Spanish/English interpreters is the result of 15 years of teaching, consulting and collecting feedback from students, interpreters, trainers, and users of our former editions. It is designed to support educators and trainers in teaching linguistically qualified adult learners. The manual was carefully developed by a team of bilingual educators, interpreters, and providers. It elicits students’ knowledge as individuals and encourages reflection through critical thinking exercises which guide students through an incredible journey of enhancing knowledge, developing key interpreting skills, as well as a great understanding of both ethical and cultural variants in the real life triadic encounter. 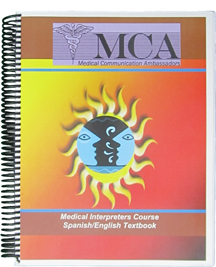 The text includes the national code of ethics, standards of practice, roles of the interpreter advanced anatomy and physiology, medical terminology, note taking techniques, Memory technique and practice, common medical procedures, common illnesses, different types of pain, immunizations and medical professionals. Over 60 role-plays and case studies. This 264 page workbook contains puzzles, case studies, practice scenarios, games, vocabulary, and a section of self- evaluation of the student. Answers to games, etc. are in the back of the workbook. For orders outside the U.S., contact MariaSchwieter@gmail.com for shipping charges. Text - $100 delivered in the U.S.
Workbook - $60 delivered in the U.S. 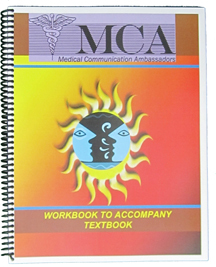 Text & Workbook - $150 delivered in the U.S.